"Serve this crab and celery salad on crackers, lettuce or stuff it in puff pastry shells." 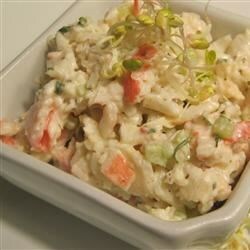 In a large bowl, combine the crabmeat, celery, mayonnaise, celery seed, paprika, sugar, pepper, seafood seasoning and parsley. Mix well and refrigerate until chilled. Didn't like this very much. And the celery should be drained after chopping. Otherwise, it adds a ton of water to the salad. Excellent - make a day ahead of time and let the flavors blend. Tasty & Easy, I left out half of the sugar though, and it tasted good! This was superb, just like the deli' make. I will be making this again. This tastes so good - a bit spicy, but we like it like that! I did add a little extra mayo to make it easier to dip with crackers.